6 gliding speeds allow you to find the right pace; 10 melodies and 5 nature sounds will delight and amuse. Is a Baby Swing Necessary? Can Babies Safely Sleep in a Swing? When Can I Start Using a Baby Swing? How Long Can a Baby Use a Swing? Are There Safety Guidelines for Using a Baby Swing? Portable or Full-Size Swing: What’s Better? Ask any mom and they’ll tell you that a baby swing could be a life-saver. Infants love the swaying, swinging, and rocking feeling, so the best baby swing provides these soothing motions. When mama needs a break, she can put her baby down in the swing and take a breather or a shower. Babies often cry when put down, but using a baby swing helps to reduce the crying. The gentle movements lull your baby to sleep, so you can enjoy some peace and quiet. Sounds great, right? 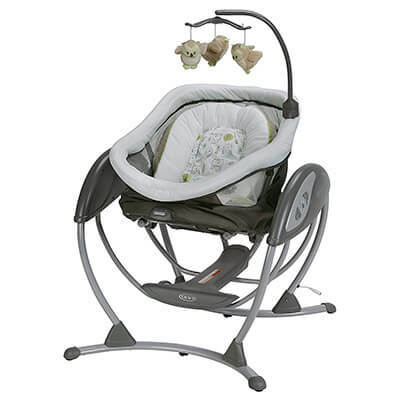 The DreamGlider by Graco acts as a gliding swing seat that doubles as a sleeper. The gentle motion soothes your little one to sleep. You can recline the seat into a sleeper with a pull of a lever. 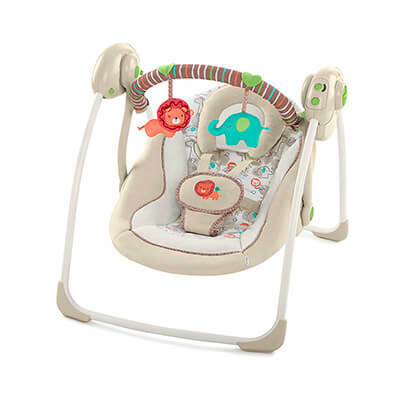 With three adorable, overheard toy owls to entertain your child, this baby swing is sure to be a hit with everyone! All of the DreamGlider focuses on is safety. In traditional swings, babies aren’t supposed to sleep because it could lead to positional asphyxiation. Graco created the DreamGlider that gently lowers your baby’s seat to create a cozy, sleep space so your baby can continue to sleep. You can recline the seat with a one-hand motion. No need to move your baby! We also like that there is a three-point harness for safety that stays hooked when your baby leans back in the glider. Also, the sides of the glider are mesh for proper air ventilation. The DreamGlider is recommended for infants 5.5 to 30 pounds, so you’ll get plenty of use out of it! Graco has several options for parents. 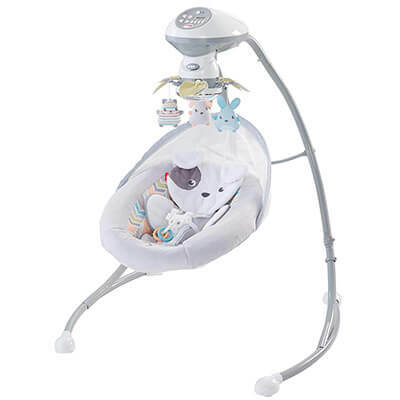 It uses the typical gliding motion but it also features two-speed vibration, six swinging speeds, classical melodies, and nature sounds to keep your baby calm and comfortable. Parents can either plug the swing into an outlet or use batteries, whichever is most convenient for you. Unfortunately, Graco does recommend that you use warm water and soap to wipe down the glider. That’s a bummer. You CAN wash some if it in the washing machine, but parts of the swing are unremovable. The Graco Simple Sway is a simple, budget-friendly swing that still has all of the necessary features and some really awesome one! The gentle, side to side motion keeps your baby relaxed and happy. 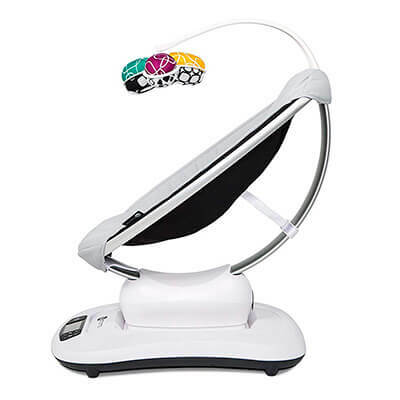 It has adjustable settings that you can adjust based on your baby’s preferences. Graco set the weight limit for this swing to be 5.5 to 30 pounds, so you can use it from birth upwards of a year old. Parents will love all of the different settings available. There are two vibration settings on the swing. 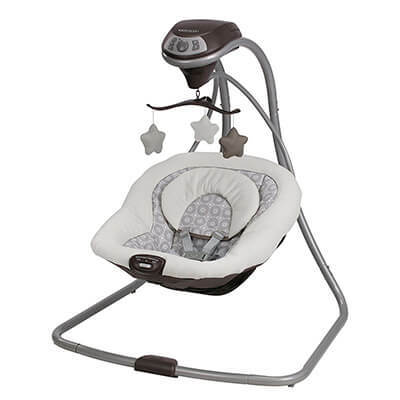 It offers six different swing speeds, so you can pick the one that works best for your baby. Also, the swing plays 10 classic melodies and five nature sounds to keep baby calm. The Simple Sway can be plugged in or battery operated, which means you can move the swing around the house as you need. It’s lightweight enough that moving it from room to room isn’t a huge deal! If you do opt to use batteries, you will need 5 D batteries, and it drains them fast! Keeping the Simple Sway clean is simple. You can remove the support and head support, as long as the entire seat pad for machine washing. Your little cuddle bug is going to love this snuggy and soft baby swing that cradles, soothes, and entertains your baby. We love that this swing also allows us to change the seat position. It can recline or be upright. It can face left, right, or center while in motion. Most swings don’t offer that feature, and it allows you to find the perfect way to soothe your baby. For safety, there is a five-point harness to keep your baby in the swing. Also, the legs are wide, creating a stable support for the swing. The weight limit for this swing is 25 pounds, which is a bit lower than other options. However, even at 25 pounds, you should have at least six months of use for this swing. You can use it from birth on with the included head support and deep recline. You can pick from six different speed settings all while in whatever position you pick. It also offers 16 soothing tunes, gentle nature sounds, and a motorized mobile. The little animals dance over your child’s head, entertaining your child, along with a mirrored globe. FIsher-Price created their swing with parents in mind, and they knew parents like options. You can use the included 120-volt AC adapter to save on batteries. The other option is 4D batteries if you aren’t near a plug. The seat pad is removable and machine washable. It’s a bit tricky, at first, to get the seat off, but after the first time, you’ll understand. Ingenuity creates one of the best portable baby swings, available in five different patterns. It is perfect for home or traveling. We love the two plush toys for entertainment. It offers a comfortable recline with two different positions. Despite the small footprint, Ingenuity made sure that their portable swing offers everything that a baby could need! For safety, Ingenuity added a five-point harness, non-slip feet, and a contoured headrest to protect your newborn child’s delicate neck. Putting babies in and out of the swing can be tricky since it’s so low to the ground, so Ingenuity added foam to the toy bar just in case you bump your baby’s head! Because the Cozy Kingdom is a portable swing, the weight limit tends to be lower. The weight limit for this is 20 pounds, which is sufficient but not amazing. The Cozy Kingdom has six different speeds that will maintain even as your baby grows older. The swing has a time with three settings – 30, 45, and 60 minutes. Parents love that and it saves on battery life. It also plays calming melodies. Another nice feature is that it has an automatic shut off which is great for moms with mom’s brain! You can only use batteries with the Cozy Kingdom. It uses 4 C batteries. Unfortunately, it is a huge battery sucker. Keeping the Cozy Kingdom clean is easy! Take off the cover, remove the straps and seat frame, then put it in the washing machine. You have to wash on a gentle, cold cycle, and you can tumble dry on a low setting. If high-tech baby gear is your thing, the MamaRoo is perfect for you. It’s one of the only Bluetooth enabled swing that can control motion and sound. It also has an MP3 plug-in, and your baby will love the interactive toys. 4Moms added a rattle, crinkle toy, and mirror, along with reversible toy balls. The MamaRoo has a three-point harness plus an infant seat that cradles your newborn. We love the infinite recline. You can lay the seat back deeply if that’s what your baby prefers. You can use the MamaRoo from birth up to 25 pounds. We did hope that it would have a higher weight limit, like 30 pounds, but it should last for at least six months for you. MamaRoo stands out because it has so many different motion and speed options. It has five unique bounce and sway motions and speeds. Unlike a typical swing, the MamaRoo uses movements that babies like the most – a ride in the car, kangaroo, rockabye, wave, and tree swing. MamaRoo only allows you to use an AC adapter. It doesn’t take any form of batteries at all. That means the MamaRoo is not portable. Plus, at 19lbs, it’s far from the lightest option on the list. 4Moms used smooth, nylon fabric that is machine washable. You never have to worry that you might accidentally shrink the fabric. It’s so easy to wash! Bluetooth enabled – can play music your baby likes. No, you don’t HAVE to buy a baby swing. You can make it through parenting without one, unlike diapers. Diapers you definitely need to have. Even though it’s not a necessity, baby swings are awesome to have because babies often love the motion of it. It can give moms and dads a few minutes of peace to cook a meal or take a shower since it probably been a few days. Don’t worry; we don’t judge. We’ve all been together before. When you have a baby who will only sleep in your arms or when being moved, you just need a few minutes to yourself in that 24 hour day. You probably see a majority of the 24 hours too. We definitely think that a baby swing is worth even a few minutes of peace each day. If it helps you retain just a bit of your sanity, get one! Since these swings are so cozy, it’s natural that your baby is going to want to take a snooze in the swing. The American Academy of Pediatrics states that swings are not meant for safe sleep. If your baby does fall asleep, it’s a wise idea to transfer him to his crib as soon as you notice. Baby swings are NOT meant for unsupervised sleep. If your baby snoozes in it while you’re watching closely nearby, that’s one thing – still not recommended. However, letting your baby sleep in the swing at night unsupervised isn’t a good idea. The answer is because the position of a swing can cause a baby to suffocate. It’s called positional asphyxiation. If your child’s chin is towards his chest, he is at risk for this, which is why experts don’t recommend them for sleep. Most baby swings can be used as soon as you bring your baby home from the hospital. If you do want to use it from birth on, make sure that it has a deep recline. Your newborn has no control over his head, so he needs to be deeply cradled. Also, the swing should include some sort of infant insert that cuddles small babies and keeps them in place properly. Most experts recommend that a baby only stays in a swing for an hour a day. However, there are no hard and fast rules around how long a baby can use a swing. That doesn’t mean you should leave your baby in it all day long. Your baby needs to be in different positions throughout the day to reduce the possibilities of a flat head. For the long term, babies should stop using a swing when they’re able to sit up on their own. Once they can sit up, most babies start to fight to be in the swing. He can easily sit up and topple right out of it. It becomes a safety hazard. Yes! Baby swings, for the most part, are safe for babies, but there are a few things you should remember. Pay attention to weight and age guidelines for the product you select. The guidelines are set for a reason. You might think that the swing is able to hold five pounds more, and chances are it can. However, the manufacturer never tested to that weight limit so you can’t be sure. Don’t risk it! Always keep an eye on your baby, especially as he gets older and starts to move. If your child can wiggle free, it’s time to get rid of the swing. Never place the swing, even a compact one, on an incline or a table. Your baby could very well possibly fall, and that’s not a risk worth taking. Try to keep the swing in an area free from dogs and other pets that could topple it over. If you have a toddler, try to keep them away from the baby in the swing. One of the biggest decision is deciding whether you want a portable or full-size swing. Let’s take a look at both sizes! It’s truly a personal decision. If you have a specific area or room in mind that you want to keep the swing and don’t plan to move it, a full-size swing is a good pick. You do want to make sure you have room to store it. It’s a smart idea to take the measurements that the manufacturer’s lists to make sure it’ll fit! Full-size swings also have great movements because the motor is at the top and they’re taller. They do tend to be more durable and harder to tip over, but they are expensive! Whether you travel a lot or are on a budget, portable swings are good options. They’re more affordable and don’t take up as much space in your house. However, portable swings typically only run on battery power, so you’ll need to replace the batteries often. Expect to drop some dollars on those! If you do travel a lot, a portable swing can fit into any hotel room. Before you make a purchase, there are a few things you should consider about the best baby swing. We use these criteria to pick our top 5 choices. Then, we lined them up next to each other to see how they stood up next to each other! Safety: Any swing that you use should have a seat belt – either a three-point or a five-point harness. It’s a necessity because it keeps your baby safe and secure in the swing. Even reclining swings need a seatbelt! Speaking of recline, if you want to use the swing with an infant under four months old, the swing needs to have an adequate recline. Infants under four months cannot completely control their necks. The swing seat should be reclined enough to stop your baby from slumping over. The swing that you pick should be JPMA – Juvenile Products Manufacturers Association – certified. Companies voluntarily have their products tested to ensure they meet ASTM International safety standards. With this certification, you can be sure that the swing won’t tip over it, unintentionally fold, or that it won’t overheat. Weight Limit: Take a look at the weight limit on the swing. The higher the weight limit, the longer you can use it. If you purchase it after your baby is born, you can pick one that will let your baby use it for at least four months. Swing Speed Settings: Some swings offer more speed settings than others. Speeds matter than others. Some babies love to swing slowly, but others like to swing as if they’re about to launch off into outer space. More options mean a better chance of keeping your baby happy. Some swings also offer different swinging directions. Most swings move from side to side or front to back. Some brands do both. Consider what type of movement your baby likes the most. If your baby likes to be rocked back and forth, that’s the type of swing you should buy. Power Source: Swings can run on either battery power or an AC adapter. Some swings have both options, which is super nice. Sometimes, you might want to take the swing with you to Grandma’s house or on vacations, which is when batteries are a great choice. Using an outlet also saves battery power and saves you money. If you do use batteries, make sure you use rechargeable batteries. Those will be your best friend because it’ll save you money. Most portable swings only run on batteries, and full-size typically offer both power cords and batteries. Ease of Cleaning: Babies love to make messes whether it’s spit-up or diaper explosions. You need an easy to clean seat. Ideally, you can just toss the seat pad into the washing machine and call it good! Some baby swing seats are coated in a waterproof material, so spills and baby puke won’t soak into the seat. Waterproof coating lets you wipe the seat clean with a wet rag with soap. You should also consider whether or not you want a portable swing. Some swings can fold up, while others are meant to be stationary in your home. If you do want a swing for traveling or heading to relative’s house, that is a very specific type of swing. Of course, there are other considerations like if it reclines far enough for a newborn and how comfortable the swing is for your baby. Soothing your new baby can be difficult at times, and a baby swing might become your new best friend in the quest for peace. Many babies find the movements so relaxing that they can calmly hang out in the swing throughout the day awake! While a baby swing isn’t a necessity, it’s sure a great luxury baby gear item to have at home. If you have a needy or colicky baby, it could be the most invaluable item you purchase! Take a look at the criteria and decide which swing will work best for your baby.